In large skillet, cook sausage and onion over medium heat until sausage is no longer pink, stirring occasionally. Drain. 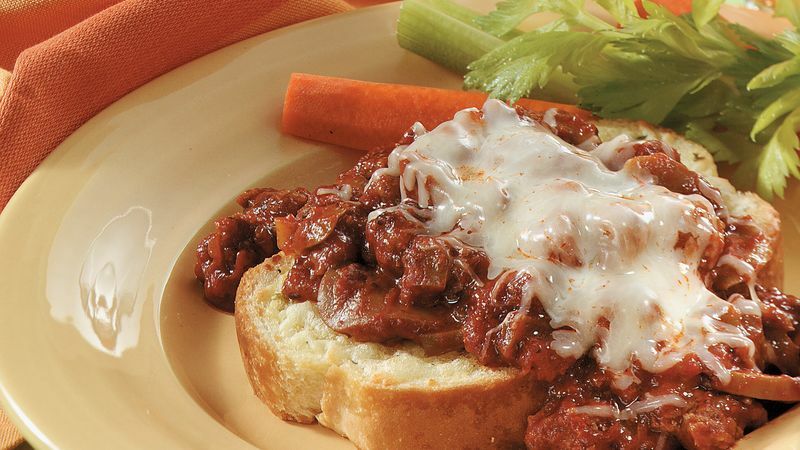 In 3 1/2- to 4-quart slow cooker, combine cooked sausage and onion, bell pepper, mushrooms and tomato paste; mix well. Top with pizza sauce. About 10 minutes before serving, heat toast as directed on package. Stir sausage mixture. Spoon about 3/4 cup sausage mixture onto each warm toast slice. Sprinkle each with 2 tablespoons cheese. Texas toast is thick slices of French bread that are coated with garlic butter. You'll usually find it in the freezer case of your supermarket. If it's not available, you can use sliced French bread spread with garlic butter.